The family of Bill and Ramona Green will host your hunt in Northwest Colorado. You will enjoy home cooked meals along with good old Colorado hospitality. Both were born and raised in Steamboat Springs. They moved to the Craig, Colorado area in 1979 where they own and operate the family ranch with two children. They have been associated with hunting and guiding for many years. After the purchase of the adjoining ranch by Dave and Dana Garner, Pinnacle Peak Adventures, LLC was formed. Replacing our trespass hunts with guided hunts and a limited number of hunters has improved the quality of wildlife in this area. Each of our guides have worked year-round on the ranches for over 25 years so they know the range well, and how the animals typically utilize it. Pinnacle Peak Adventures, LLC. also holds a BLM recreation use permit to hunt the small amount of secluded BLM ground within the private property. Pinnacle Peak Adventures is located in the Northwest corner of Colorado with some of the best elk and mule deer hunting in the state. We offer fully guided hunts on approximately 6,000 acres of private land. Our property is located in Management Unit 4. The number of hunters per season is limited to 4-6. Your hunt will include a house with modern accommodations, three meals per day, and transportation to and from the hunting area. We offer privacy and a very exclusive experience. ​ The ranches are located below the Routt National Forest. 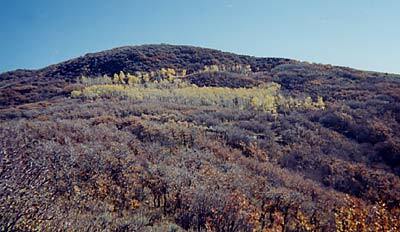 The terrain consists of hills covered with service and oak brush in the upper portion, to the lower end, where it is primarily sage brush covered range. In the middle, irrigated meadows and alfalfa fields can be found. This allows us a variety of hunting methods. Most of the acreage is accessible with vehicles and we walk to the remote edges. We can put as many, or as few miles on your hiking boots as you wish. The elevation ranges from approximately 6,500 feet to 7,500 feet above sea level.